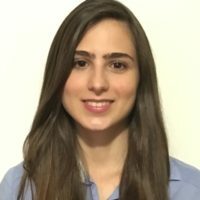 Beatriz Nasciutti, Consumer Insights Analyst - Haig Barrett, Inc.
Born and raised in Sao Paulo, Brazil, Beatriz Nasciutti is always eager to bring a new, global perspective to Haig Barrett’s clients. After spending a few years in San Francisco, California, where she earned her B.A. (Honors) in Psychology, Beatriz recently traded in foggy days for sunshine and clear skies in Los Angeles. She will soon earn her Master’s degree in Organizational and Consumer Psychology from the University of Southern California. A thinker through and through, Beatriz uses her naturally analytical mind to excel in projects regarding organizational development, marketing, and consumer behavior. She is very glad to start her career at such a talented (and fun!) organization like Haig Barrett. Beatriz enjoys conducting qualitative and quantitative market research, and create strategies based on brand awareness, trial, and usage studies. As natural as she is in the workplace and in the classroom, Beatriz is not one to forget about living! She is a staunch advocate for social justice, and is never afraid to challenge the status quo. When she is not working or studying, Beatriz is not too far away from her three lovely cats–that is, if she’s not out and about in the city, enjoying the trendiest food and watching live music.